Pedalpower Classic Steel Tandem. The beauty about this particular tandem is that it can can be detached into several parts via 6 special couplings, so it can be transported easily, or at least easier than a non-detachable tandem. The bike is built from components which are all of the highest quality and highlight is the Rohloff Speedhub (more info: rohloff.de) World famous for bomb proof reliability, perfect wide ranging gears and super low maintenance. Our last tour we used a Thorn Raven Twin, Which was also equipped with the Rohloff and was it faultless – it was the natural choice for our next bike and tour. Model: ClassicSteel Detachable Frame size: 43cm Frame material: CroMo Gearshift: Rohloff 14 Speedhub Rims: A-Rim Tandem Tyres: Continental Touring Plus Front Hub: Pedalpower Tandem hub Rack front: Tubus Ergo Rack rear: Tubus Logo Brakes: Avid BB7, mechanical disc brake Mudguards: SKS Germany Rear handlebar: Pedalpower Multifunction (enable upright comfortable seating for the stoker, individually adaptable) Bar grips: Ergon(front: GP1, rear: GP3) Chain guard: Chainrunner (keeps chain clean, easy to handle when tandem is detached) see chainrunner.de for more information Pedals: Procraft (cartridge bearing for a super smooth operation, High durability) Rear light: B&M Toplight permanent Bottle holder: 6x SKS Slidecage Bottles: 6x Elite (2x 1l, 3x 0.75l, 1x 0.5l) Bike Computer: Sigma 1609. Ortlieb Back Roller Classic Panniers x 4 We have gone for the well proven set up of Ortileb Classic Roller Panniers, with a little twist. We are using the larger back roller panniers back and front. Despite the fact the back rollers are designed only to be used on the rear rack of a bike – it is possible to mount them up front. We found on our tour of Europe that we could never have too much storage, and now with the girls in tow that’s even more gear we have to be able to store. 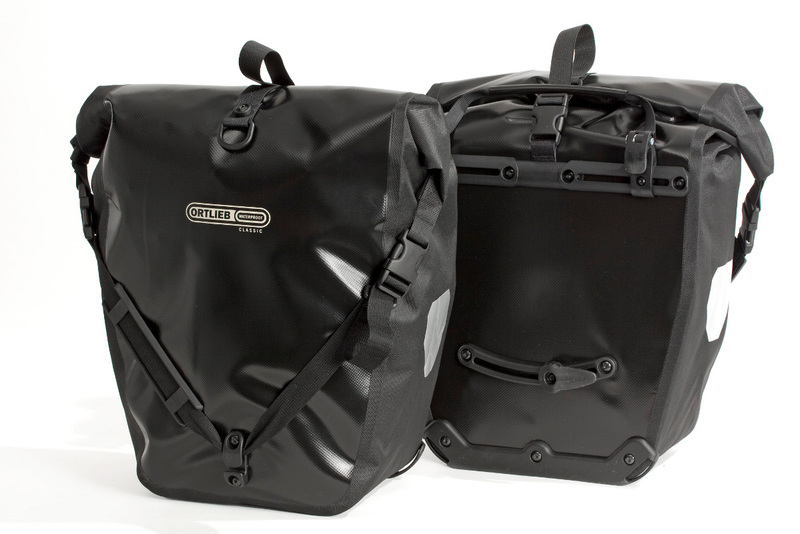 The Ortlieb panniers are 100% waterproof and we really put this to the test when we were touring through Europe, we were once caught in a flash flood and the front panniers were dragging through the water as we cycled, at the end of of the day all our gear was bone dry! 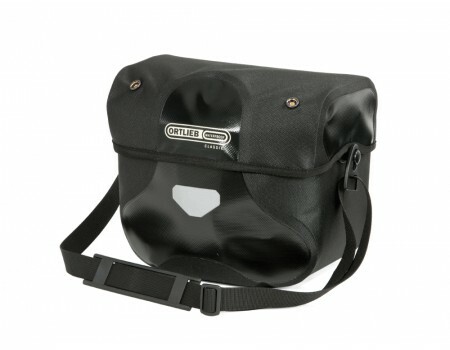 Ortlieb Ultimate5 L Classic 8.5 Ltr Handlebar Bag It’s funny how attached you can become to a small black bag. The bar bag is the single place to store all you valuables, wallets, passports, phones, iPods ect. We also use ours to store on-the-go snacks like dried fruit and nuts. The beauty of this bar bag is it’s Marry Poppins like interior it holds a seemingly limitless amount of gear, and its 100% waterproof too! The mounting system allows you to take the bag (and therefore all of your valuables) with you at the push of a button, so even if your only leaving the bike for 10 seconds there’s no reason not to take it with you. 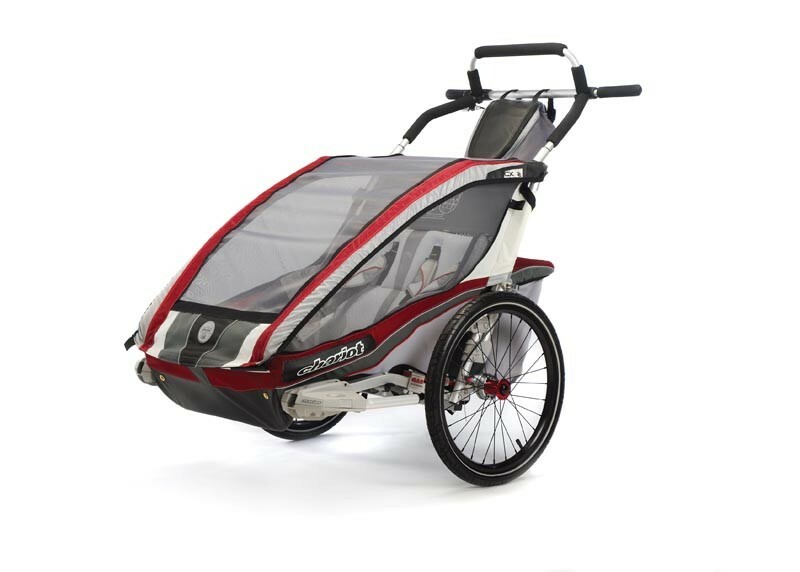 Chariot CX 2 Bike Trailer When we purchased our trailer we researched the market for months and decided on the chariot, it was head and shoulders above the rest for quality, safety, versatility and comfort for two kids. Nothing else came close. When we fly it’s technically a stroller at least thats way we tell the airlines, and that way they will carry it for free! Go Lite Shangri-La 5 This must be the most under rated tent in the cycling world. It packs small, it’s light and it’s like a Tardis on the inside. Big enough to sleep 4 with all your bike panniers inside the tent! We used this on our last tour of Europe and we encountered some pretty bad weather and it always remained 100% dry inside. 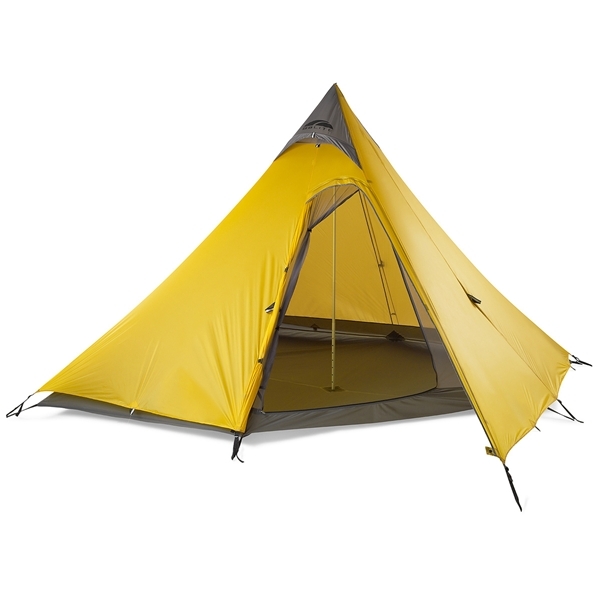 The other added bonus of this tent is that is is super fast to pitch – 1 pole and 4 pegs and your out of the rain. Despite the fact its a 2 part tent (mosquito net inner, and waterproof outer) both parts are erected at the same time unlike may other tents where you have to pitch the inner first then the outer, leaving the inside of your tent wet in a storm. There is also the option to pitch just the Mosquito net in hot climates. 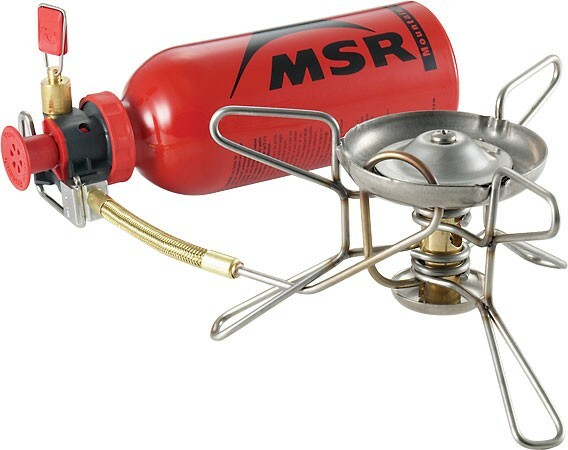 MSR Dragonfly Stove. We have yet to test out our new stove, but after extensive research and with rave reviews across the board we were more than sold. On our last tour through Europe we used the excellent JetBoil. The only problem we found was sourcing gas. Even in the most developed parts of Europe we often struggled to find gas and ended up eating cold porridge for days on end. There is no risk of that with this stove! We have opted to carry 2 X 875ml fuel bottles. I’m sure many people would suggest that this is overkill, but this way we can guarantee that we will never have to go without a hot meal or that vital cup of coffee in the morning! 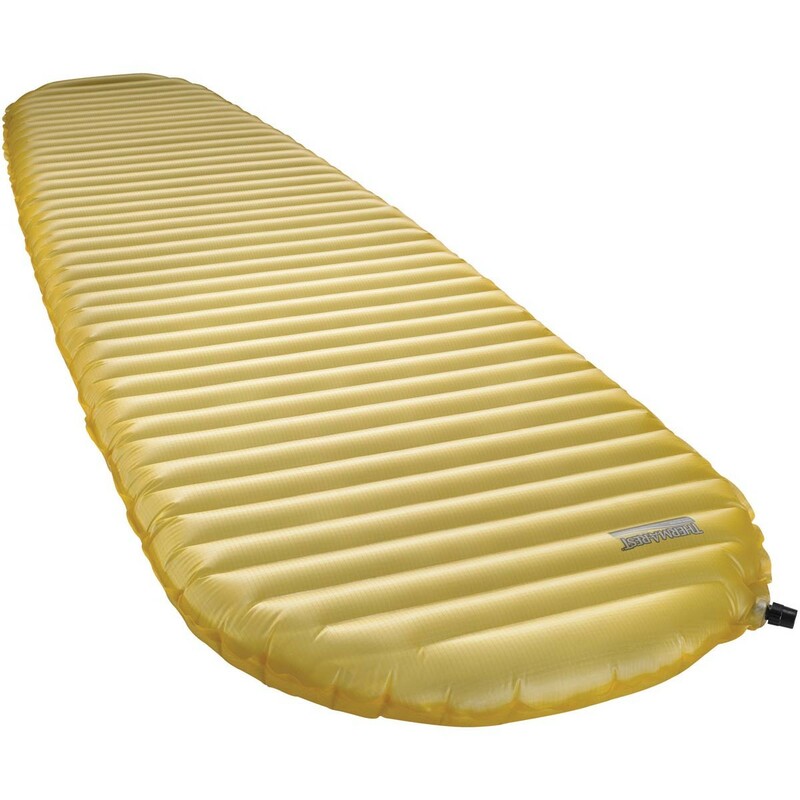 Thermarest NeoAir XLite At 350g this mattress is feather light and packs almost as small as a can of Baked Beans. Again another product which received rave reviews form almost everywhere we looked. A good nights sleep can make or break a camping trip, and it the effects are multiplied as the days roll past. Jay had an older Thermarest which served him well for many years of hard use, until it gave way in spectacular fashion on a beach in Croatia – that is another storey entirely! Enlightened Equipment Quilts Yes you read the title correctly quilts. We are always looking for an alternative solution to a problem, and we quite enjoy straying from the “norm”. The challenge we had was to find 4 sleeping bags that wouldn’t take up all the space in our panniers, keep us warm on the cold mountain passes of NZ & not cost the earth! After months of research the seemingly impossible task has been solved by a bloke in the US hand making quilts in his home in Winona MN. Katie & Jay are having RevelationX 850 fill down quilts made, while the girls are having ProtegeX Climasheild synthetic quilts, all 4 are rated to -7 Celsius. All up the 4 bags weigh less than 2 Kilos combined and cost less than one brand name adult sleeping bag! The great thing about the girls quilts is that they are specifically designed for kids, and have a range of safety features to reflect this. We are super excited about our sleep systems and will throw up some pics as soon as they arrive. Light My Fire Titanium Spork Now this might not seem like the most interesting part of our gear list, and i’m sure there will be many out there who are wondering why bother writing a review, well let me tell you. 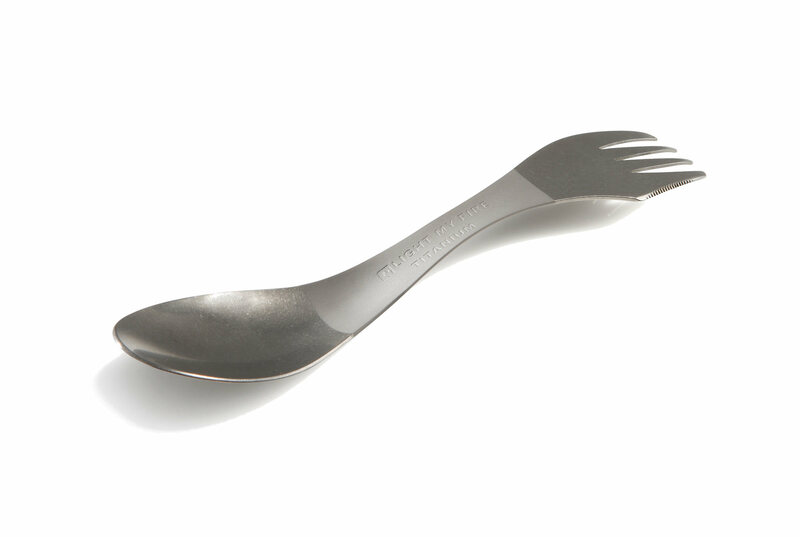 We love our Sporks, they really are the only piece of cutlery you need. We used the plastic version for a couple of years until it broke, and our life was revolutionised when Jay’s younger brother Chris brought him the Titanium version for Christmas one year. We would recommend them anyone and everyone and we wouldn’t leave home without one.